Simple operation combined with maximum efficiency: the new KMD 78 from KIEFEL. High output and considerably-lower production costs for the manufacture of formed components made of PS, OPS, EPS, PP, PE and PET. 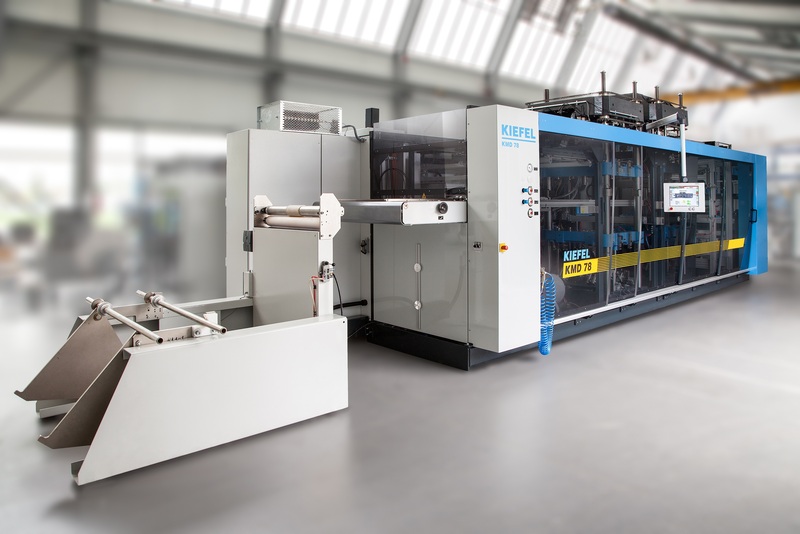 The KMD 78 automatic pressure forming machine has allowed Kiefel to extend its KMD series to include a particularly cost-efficient variant, which supplies just the right amount of forming technology to cover a wide range of components. Advanced technology is the secret. Equipped with HTS ceramic heaters for the consistent distribution of heat-output, with well proven toggle drive and motorised upper-yoke adjustment for both the forming and cutting stations, the new KMD 78 fulfils all the essential requirements for the cost-efficient production of formed components. Tension bars help ensure both the play-free movement of the drive components and the precise repeating accuracy of cutting procedures. A newly-developed, two-stage cutting system provides a particularly accurate cut. The fully-adjustable stacking unit operates from bottom to top, while the formed components are placed onto a conveyor belt.Fast reconfiguration to cope with different product formats guarantees fast tool-changeovers in the forming and cutting stations. Horizontal adjustment of the spindle drive permits efficient length-adaptation of the corresponding formats. The KMD 78 is equipped with a touch-screen-operated Siemens Simotion control system. The unit can handle a maximum form-size of 760 x 540 mm, with a negative/positive formed-component height of up to 150 mm and a maximum film-width of 810 mm. At this year Chinaplas the KMD 78 will be on demonstration with a fruit-tray tool processing clear APET material. KIEFEL is a world leader when it comes to the design and manufacture of machines used to process plastic film materials. The company offers core expertise in the fields of moulding and joining technology. As a supplier to reputable manufacturers in various sectors, Kiefel GmbH services customers in the automotive, medical technology, refrigeration and packaging industries. The head office of KIEFEL GmbH is in Freilassing/Germany. The company also runs its own network of sales and service centres in the United States, France, the Netherlands, Russia, China, Brazil, Indonesia and India, and is represented by sales partners in more than 60 countries worldwide. Kiefel GmbH is a member of the Siegsdorf-based Brückner Group, a world-leading supplier of machines and plant systems for use in the plastics processing industry. The group has some 1,700 employees. Brückner is a world market-leader in stretched-film systems, and its range of products also includes production systems for the manufacture of extruded and smoothed flat film materials, with an equally-large range of services to match. Group member-company PackSys Global is a manufacturer of equipment for the packaging industry, specialising in production lines for use in the manufacture of tubes, lids, screw-in adapters and containers.